The Mesomega® injector gun is your most valuable tool and asset in Mesotherapy and will give you the greatest advantage in the application of various Mesotherapy procedures. 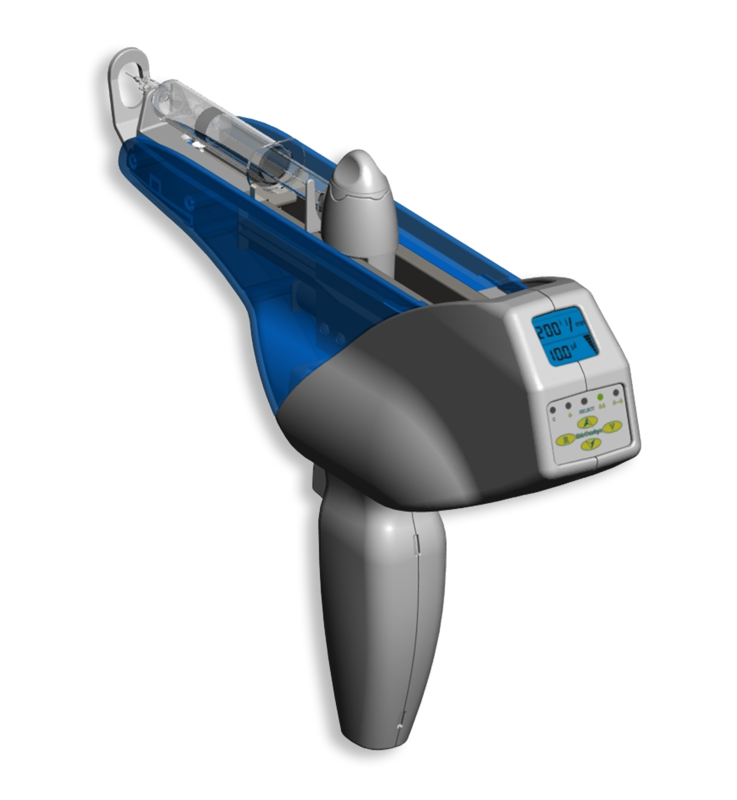 The Mesomega® provides exact depth and dose control to ensure consistent results. It can be used with all standard syringes from 1ml – 20ml. This device comes with LCD screen display and four treatment functions: Continuous, Dosimetric, Nappage and Mesoperfusion. DO I NEED A MESOGUN? Yes, if you wish to shorten the length of time for each treatment and you find that you are regularly performing Mesotherapy. Yes if you wish to make the treatment as comfortable for the patient as possible, or you feel that using equipment within your practice is an important factor. The technique of the injection itself and the skills of the mesotherapists are factors in the amount of pain resulting from Mesotherapy injections. With regard to speed of penetration of the needle into the skin, the faster the penetration, the less pain for the patient. The use of the Mesomega injector gun which is able to penetrate the skin in a fast, more steady and repetitive way will help to ease the pain. Injecting large amounts of products repetitively will inevitably result in hand fatigue. This is not only uncomfortable for the mesotherapist and the patient; it can cause inconsistent results. Now consider this, if you believe your skills and expertise to be good enough to compete with a fully automatic device, you may prefer the manual technique over the use of a meso gun.